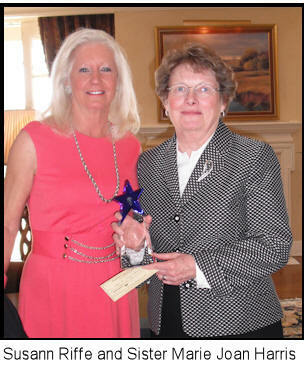 President Susann Riffe presents Dr Marjorie Blank with her honorarium as the first recipient of the Elbert Cole Legacy Award at Mission Hills Country Club. 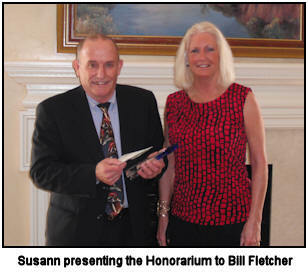 (William) Bill Fletcher was one of the first names to come to mind because he has been and is so helpful in many of our programs and services which impacts not only our clients but also each of the staff. He is always enthusiastic and does more than asked. He genuinely has a heart for older adults– particularly for those who are struggling. decorate. This past Thanksgiving Bill arrived at SCN at 4:00am in the morning to fix his “special brine prepared turkey” for the BreakTime feast. (And by the way, it was delicious!) Bill continues to visit a couple of the male clients weekly at home and in a nursing facility who can no longer attend BreakTime because of their health. It means the world to these gentlemen! In that role, he is also one of our favorite Respite Volunteers. Bill has also encouraged several of his friends to volunteer at Shepherd’s Center of the Northland. In 2010 He guided a group of Ford employees around to 20 of our clients homes to do some winterizing of their homes. He was a great spokes person for SCN. They all returned to the center laughing and asking when they could come again. He is a Transportation volunteer...one of our clients who he has particularly connected with is deaf. While some volunteers might be reticent to handle any handicap- Bill never hesitates. Many who have ridden with him, request him every time they call. He has also done some Handyman jobs for clients and always offers to help the staff with extra projects. Bill, true to his roots with SCN, has also assisted several our clients with computer problems. He is patient and kind and always goes the extra mile to make sure to answer any questions they have . 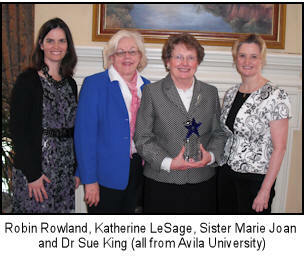 Avila University was founded by the Sisters of St. Joseph of Carondelet in 1916. 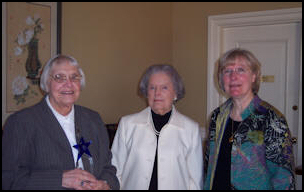 For decades the sisters taught Avila students both in the classroom and out. 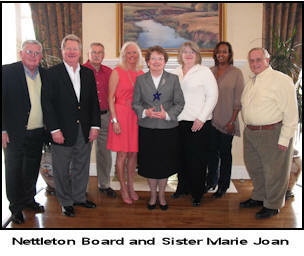 Today, Sister Marie Joan Harris is the only remaining sister on campus actively serving the Avila community. Her legacy of leadership, not only as a sister, but as an academic leader is felt throughout the campus. She led the initiative to create the Avila Value Statements that can be seen throughout the campus. As the chief academic person she guides and leads the faculty as they represent the Avila vision and values to the students. She collaborated with the faculty to revise the core curriculum and develop new programs and majors. She led the successful self-study for continued accreditation by the Higher Learning Commission of the North Central Association. She led the University in a successful development of the 2002-2008 Strategic Plan and currently is leading the revision of the current Strategic Plan. She restructured the faculty professional development program and initiated a comprehensive professional development program for adjunct faculty. She obtained funding for academic projects through successful funding of 10 national grants. She also created and led the implementation of Avila University’s Advantage Program for adult learners. The Advantage Program serves the adult learner with evening classes and represents 25 percent of our student population. Sister Marie continues her leadership and influence at Avila through her emphasis and direction on the university’s Service Learning and Volunteer Service Initiatives Program. With Sister’s leadership, Avila’s Service Initiative provided 200,000 hours last year of donated service-learning and volunteer hours to the community. Our undergraduate students served non-profits across the city, including: Harvesters, Kansas City Free Health Care Clinic, Habitat for Humanity, St. Joseph Medical Center, among others. 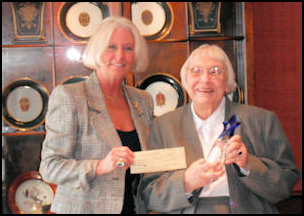 Sister Marie has not only served the student, faculty and staff of Avila University for 41 years as an academic leader -- she has also served the community at large by serving on nine boards providing leadership, guidance and influence. Her board leadership includes: Board of Directors of Carondelet Health (2002-present), Advisory Board of St. Joseph Institute for the Deaf (2007-2011), Advisory Board of KC REACHE, a distance learning consortium,(1997-2001), National Advisory Board of Deans for Council of Independent Colleges (1995-2001), Province Council Member for the Sisters of St. Joseph (1992-2002), Board of Directors of St. Teresa's Academy (1989-2002), Board of Trustees of Fontbonne College (1983-1989), and St. Joseph Health Center Board of Directors (1978-1984). When most people, at her age of 70, might think about cutting back on their service and work in the community – Sister Marie continues her commitment to serving not only Avila, but other organizations she holds close to her heart. In fact, she actively looks for new challenges to take on to help Avila and her organizations become better. One senior level educator at Avila shared a personal story of how Sister Marie helped him at a particularly difficult time in his life. He was struggling with his personal identity and direction in life. Sister Marie provided not only her professional help as his Academic Dean, but also guidance spiritually and personally as he grappled with personal matters. She embraced the virtues of the Sisters of St. Joseph of Carondelet and provided him the love and support he needed. At Avila we call this “serving the dear neighbor without distinction.” Sister Marie not only demonstrated this with the senior level educator, but with everyone that she interacts with on a daily basis. She is a humble and quiet leader – but an excellent example of how one person can influence so many in a positive way. When some may think representatives of the Catholic faith are narrow in their views, Sister Marie demonstrates her belief that we are all called to be the unifying love of God and to serve the dear neighbor without distinction. Charlie’s long career in Social Work and especially his civic engagement as a volunteer epitomizes the spirit of Dr. Elbert Cole. Charlie retired from Liberty Hospital in 2012. 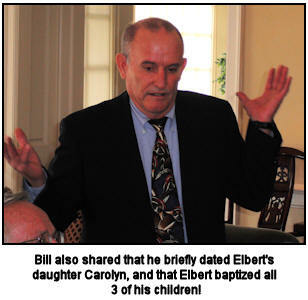 He served at the Director of Social Work for 31 years. 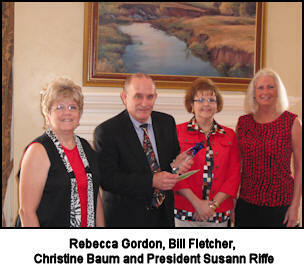 He is a founding board member of Clay County Senior Services and served from 2004-2013. 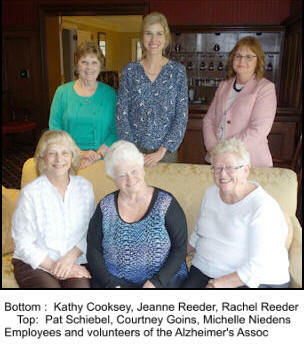 Charlie serves on the Northland Meals on Wheels’ Board and has for many years. Charlie also went to Seminary School and is ordained as a minister, possessing many of the values and attributes of Dr. Cole. 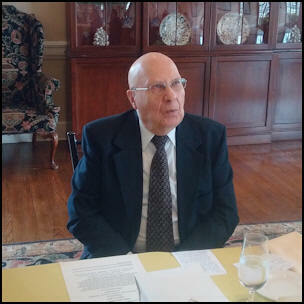 Life-long learning and education is also important to Charlie; while serving on Clay County Senior Services’ Board he attended the American Society on Aging’s conference each year; an organization that Dr. Cole was very involved in. Charlie has touched the lives of hundreds of families that have gone through Liberty hospital. He has helped families cope with grief and loss, arranging services and resources and has been an advocate for the health and quality of life for older adults. His dedication to serving on senior related boards is commendable and deserving of this recognition. Witnesses have observed tears in his eyes during tender moments, such as when his board term ended with our organization, and wonderful laughter in times of joy. 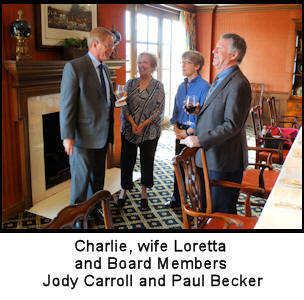 Charlie and his wife, Loretta are also raising grandchildren. 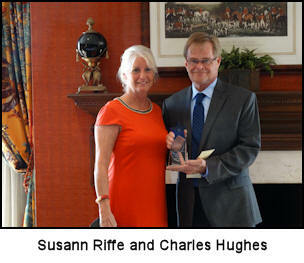 Liberty Hospital Foundation established The Hughes Family Assistance Fund in honor of his many years of service. Vivian Crosby nominated Brian for his many volunteer rolls, also a part-time employee at his church and at a local funeral parlor. He is a perfect example of a senior dedicated to giving back. He continues to use his many talents to serve others. After touring the world as a professional opera singer he found his encore performance by working and volunteering at his church, in the public schools, through Rotary, on the board of Good Samaritan Society-Communities of Olathe, with the Olathe Community Orchestra and in politics. He is a man with a big voice and a big heart and quite a hero. He is an inspiration to members of his church, Grace United Methodist, and he volunteers at Center of Grace in the clothes closet and serving meals to the needy. He coordinates the New Horizons adult worship program, coordinates blood drives and other fundraisers and also sings in the choir. 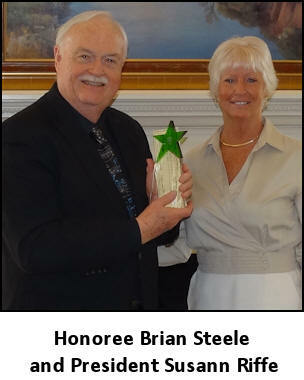 For several years Brian directed a Senior Serving Schools Chorus that did patriotic performances in the schools and for the community. As a Stephen Minister with his church, Brian visits seniors and hosts a monthly coffee with residents in Assisted Living at Cedar Lake Village. He can also be found at Rotary fundraisers and ringing the Salvation Army bell on street corners. "Volunteering in my senior years has given me purpose and self worth. I like to think that I am paying it forward and helping others while I can. Someday others can help me." Jeanne is 72 years old, with health issues and just goes nonstop. She came to social work late in life, but what has been consistent throughout her years is the devotion to helping others. Not only does she spend long hours meeting with families and facilitating various groups, she takes time to make birthday desserts for attendees in the social engagement program she directs for those with earlier stage Alzheimer’s disease, she makes food for clients who are ill and initiates activities to raise money for the cause. In her free time, she is a volunteer guardian; she assists in her church and is the first to step up when there is a need expressed among her friends, coworkers, or even acquaintances. 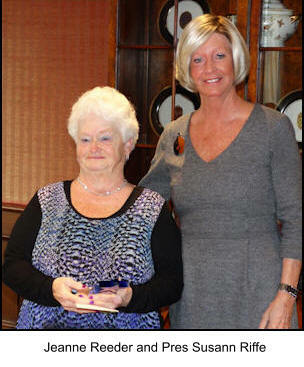 To know Jeanne is to love Jeanne and there are many, many people in our community that would affirm that. She has such a bravery about her that pushes past uncertainty, fear and pain. She, like Dr. Cole, knows that everyone makes a difference and is worthy of being listened to and respected. Age doesn’t change that and neither does Alzheimer’s disease. 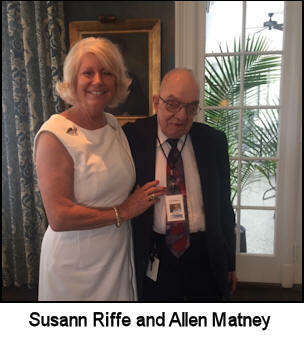 Eighty years young Allen Matney, of Don Bosco Senior Center, is the 2017 recipient of the Elbert Cole Award. Growing up, Allen lived in a Christian sponsored orphanage, which later became a children's home, in Kansas City, KS, until the age of 22. 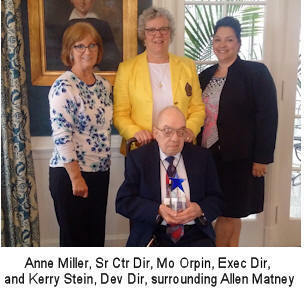 Throughout his life, he has maintained the selfless nature that the Bank of America Neighborhood Excellence Initiative recognized with their 2011 Local Hero Award. As a 12 year volunteer at Don Bosco, his dedication is an understatement. Despite a limp, he walks the six blocks from his house to the center, 5 days a week, and rarely misses a day. Allen is committed to serving others and always with a smile and a good sense of humor. He also sings to the congregation and leads the daily blessing before meals. Allen is a Kansas City treasure, as was Elbert Cole, and we are proud to present him with the award this year. At age 84 he faithfully leads a volunteer group of 13 retired men in Metro Lutheran Ministry’s Minor Home Repair team who build wheel chair ramps and do other modifications that allow low income seniors to age in place. During the time of his leadership the team has worked on nearly 1000 homes. 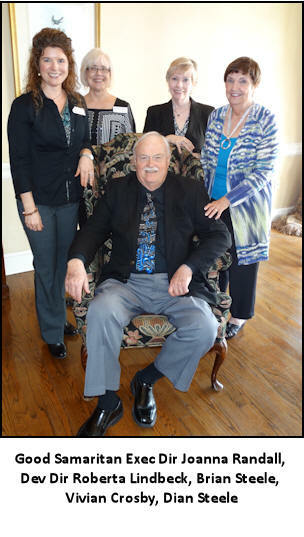 LeRoy has a long history of distinguished service helping people who are poor and homeless. At MLM he served as a board member for 6 years and helped the organization redefine itself and become a community leader. In addition to his volunteer service with MLM, LeRoy is active with Revision, a ministry for families of prison inmates, and Arts in Prison. The low income seniors who are able to stay in their homes and live with dignity rather than move to a Medicaid nursing home give ringing testimonials about LeRoy and his Minor Home Repair team. LeRoy works more hours than anyone else, does the planning, and makes sure the work is done correctly. Invariably when LeRoy’s team is in these homes they find other critical safety issues and fix them as well. LeRoy’s team is the best example of faith based ministry in our agency.